Beetroot salads are a great way to include this antioxidant pigment rich root vegetable in everyday meals. One can always make smoothies with beetroot or can add it to curries or raitas but a simple salad is more suitable for a meal when you are alone or when you need a good looking salad for an elaborate meal served to family and friends. I have seen huge bowls of salads disappearing in minutes when served to friends or when the both of us make such salads for weekend lunch. So whoever says salads are boring, has never had a good salad I say.The beetroot salads I am sharing today have all the potential to become family favourites as we have had these salads numerous times and even after refrigerating them for a day or two. 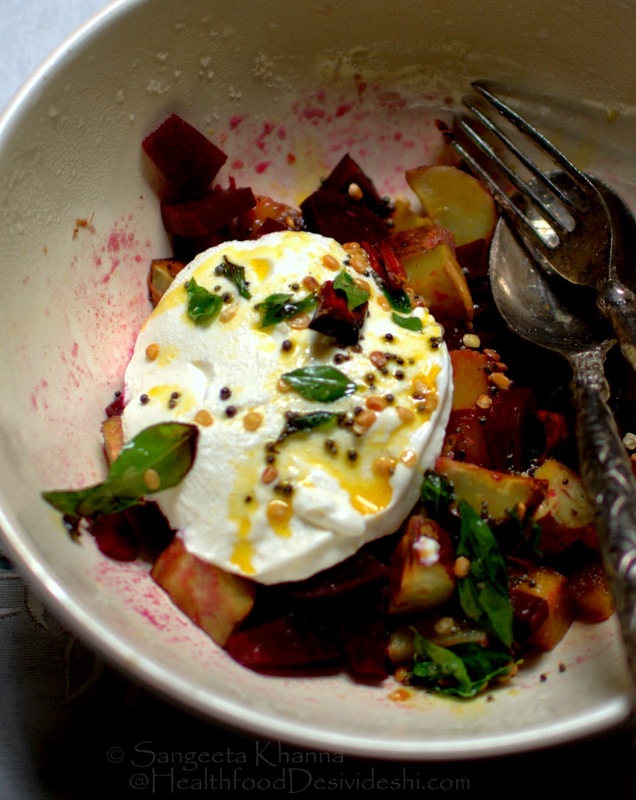 Even the roasted or boiled beetroots stay well in the fridge if drizzled with some balsamic vinegar or any vinegar of choice. Without vinegar the cooked beets stay well for 4-5 days easily. Keeping them ready to use is a great help when considering beets are so messy to chop and shred. Beetroots lower blood pressure owing to the presence of Nitrates in them which converts to Nitric oxide in the body and dilates and relaxes the blood vessels. Beetroot consumption is known to enhance stamina by the action of Nitrates as well as betaines found in them. Betaines help fight inflammation in the body too, good for heart health and overall fitness and performance. The pigment profile of beetroots makes it a good anti-carcinogenic, the anti-oxidant property helps the body take care of ageing and wear and tear. Beets are rich in essential minerals, fiber and immune boosting Vit C, and B Vit folate, great for healthy skeletal system and internal organs. Beetroot helps cleanse the system and make the liver and GI tract healthier. A great salad would always include ingredients that pair well taste wise and their nutrient profile is complementary. All the ingredients should contribute nutrients in a way that it helps better absorption into the system. Like if one ingredients is iron and calcium rich, there should be some other ingredient that is rich in Vit C as the minerals wont be absorbed in the absence of Vit C.
Likewise if there are antioxidant pigments of the carotene family thee should be some fat (oil) dressing in the salad or in the same meal, as all such antioxidants and Vitamins are fat soluble and would be wasted if you did not add any oil or natural fat like Avocados or coconut. Adding nuts or cheeses to such salads makes sense in adding protein as well as good fats to improve the nutrient profile of the salads. Adding cooked chicken breast or fish or bacon is a good idea to bring more proteins and healthy fats into the salads. Add moe greens like lettuce, rocket or baby spinach or micro greens in such salads to make them tastier and Vitamin rich. Lime juice and tamarind extract are great for the acidic ph that helps absorption of many minerals. Yogurt or buttermilk dressing also serve the same purpose while vinaigrette is more common in salads. I must add if you find the salads insipid with the available ingredients, just whiz everything up and make a smoothie. 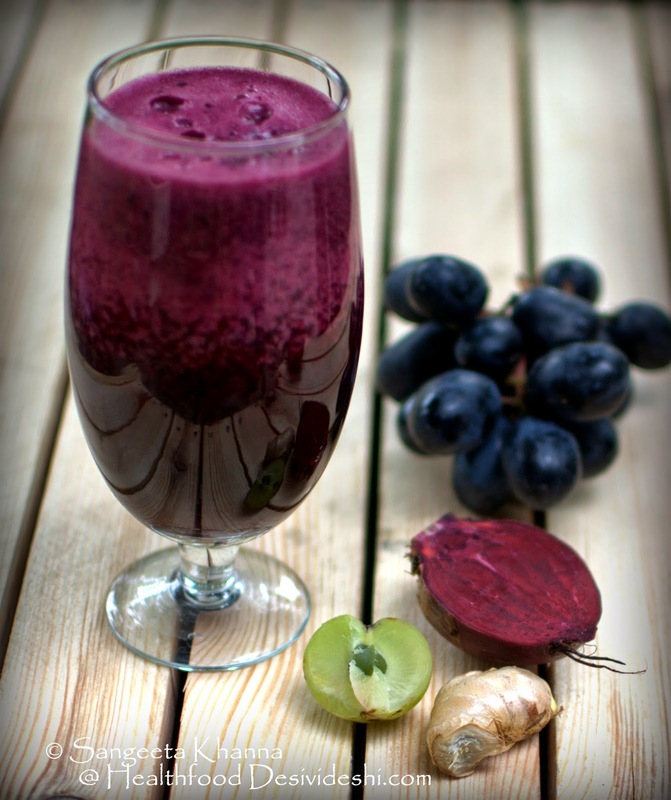 Like this beets, black grapes, amla and ginger smoothie is yummy and nutritionally balanced as well. I tried this recipe once when the papaya I had bought turned out to be very insipid in taste. 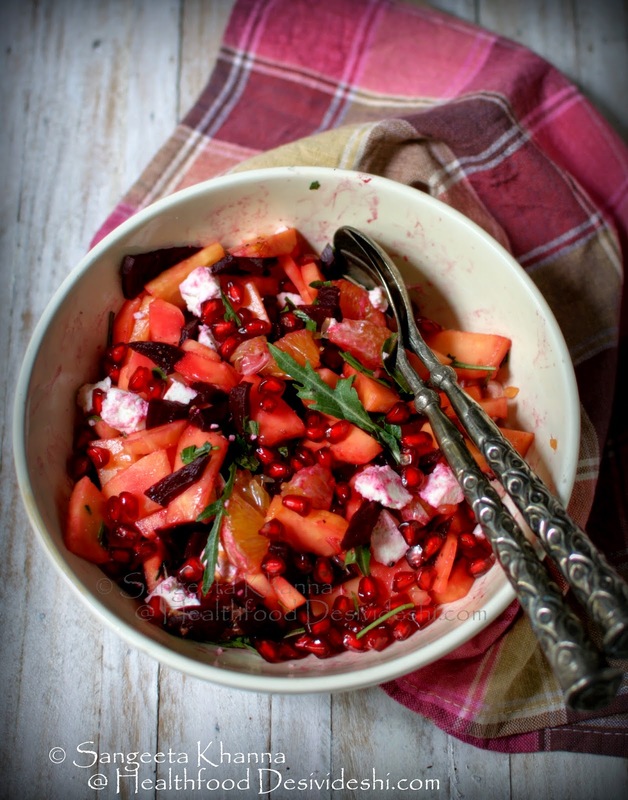 I found the balsamic pickled beets added the much needed flavour to the papaya and pomegranate seeds brought the much needed texture. I Used some home made feta cheese and rocket leaves from the garden and this salad was an instant hit. The salad has been a frequent weekend lunch for us since then. **To make pickled beets I just cook the beets in microwave, chop them in small slices and douse them with a little salt and a generous pouring of balsamic vinegar. It keeps well in the fridge for a month or more. I use the pickled beets for many salads or just as it is. Just toss everything together and mix well. Add the pickling liquid of the beets as well. Serve after 10 minutes so the flavours get some time to mingle. 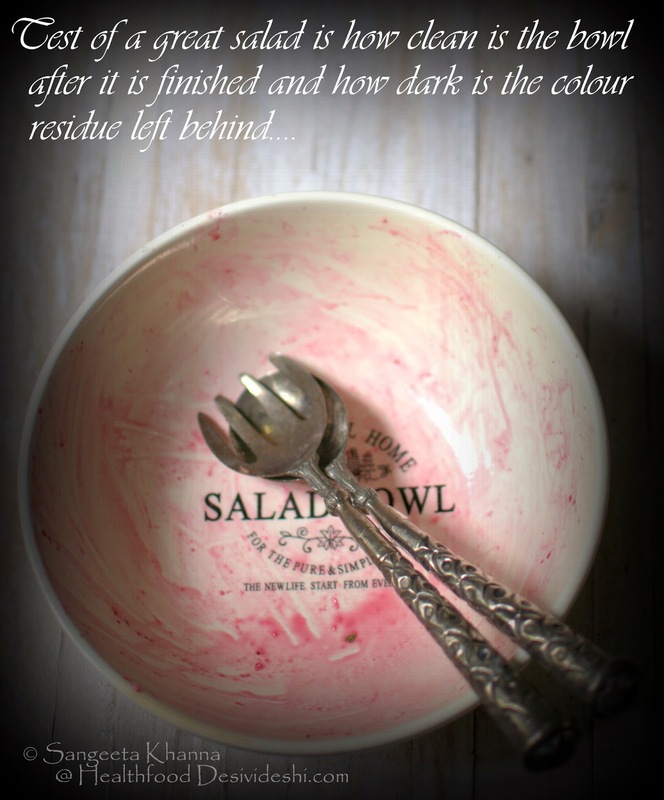 This salad stays well for a day or two in the fridge, but everything will look deep pink after a while. 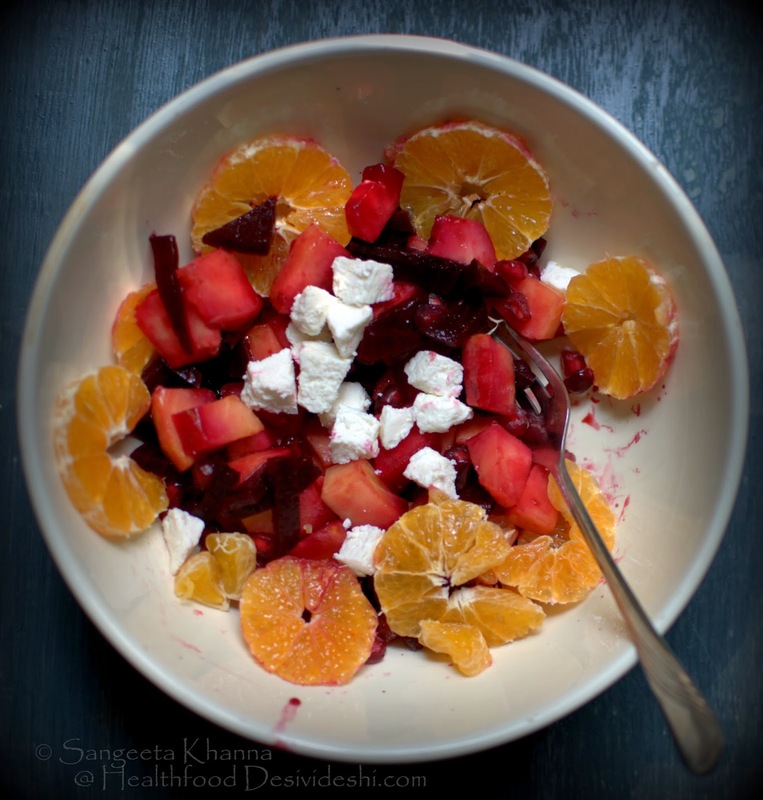 recipe of beets, pumpkin and sweet potato salad with a south India tadka dressing.. I used pan grilled pumpkin and sweet potatoes along with microwave cooked beetroot slices for this salad. Once the cooking of the vegetables has been done the salad can be put together in seconds. Pour the yogurt in a fine mesh strainer (or lined with muslin) and prop it over a bowl. Keep this hung curd contraption in fridge. It takes about 3 hours minimum to get hung curd but it stays well in the fridge for 2 days. Keep it ready to use. Peel, cut into half and microwave the beets for 3 minutes. Chop in bite size pieces and cool down. Clean the sweet potato, retain the skin but remove any blackened skin. Slit lengthwise and keep aside. Clean the pumpkin slice, retain the skin and keep aside. Heat a skillet, brush with butter or oil and arrange the pumpkin slices and sweet potato halves on it, sprinkle salt and cover to cook on medium heat. Turn and cook on the other side for 3-4 minutes or till both sides are lightly charred (browned) and the flesh is soft (but not mushy). Remove from pan and chop in small bite size pieces. Cool. Now mix the beets, pumpkin and sweet potato pieces. Now invert the hung curd over the vegetable mix. Now you can actually mix the yogurt with the vegetables but it will get pink immediately. So I keep the hung curd like this till we actually eat this salad. Looks good too. Now is the time to make the tempering dressing. Heat the oil and tip in all the tempering ingredients. Let them get aromatic and then pour everything over the disc of hung curd. Let it sit till the salad reaches the table. Mix it when you want to eat it. Mixing it on lightly the table is an exciting activity as I find people getting curious about it. We are a salad couple now. There is a salad meal almost 3-4 times a week and we both love it. Although I keep making some quick salads for myself in the day time and eat them all alone too. Can't live without vegetables even though I eat so many other things too. 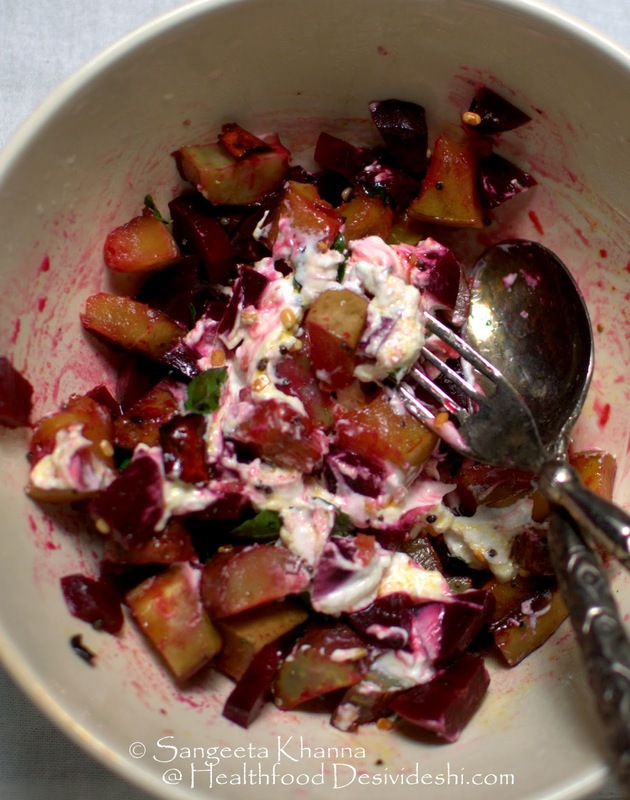 Hope you like these two different types of beetroot salads and try them in your own kitchen. 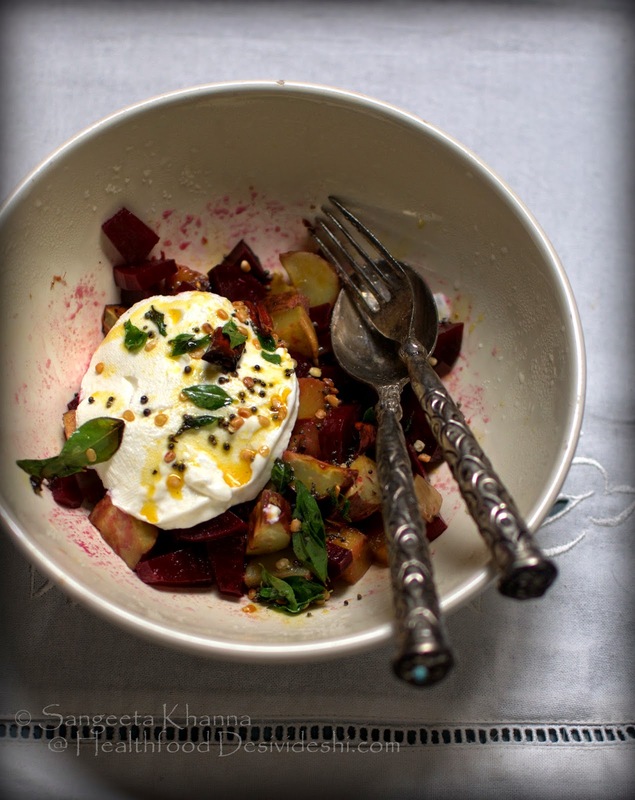 Please do let me know if you like beetroots a bit more after trying these salads..
Sangeeta your salads are very creative and inspiring. I discovered some Eastern European women(lovely,young,tall and thin with golden hair, spotless skin and ruby lips) do not cook. They have these large salads in a bowl that contain almost anything imaginable. From boiled potatoes, to cucumber, any kind of fruit, nuts, raisins, figs salad greens, sprouts, citrus juices they even indianise it by throwing in some murmura and sev. Boiled egg is common though I am unsure about meats and fish. If their energy levels, fitness and beauty is anything to go by they must be doing something very right. Your salads reminded me of my friend Tatyana from Kiev who would spend an entire day without eating and still look like a million bucks. 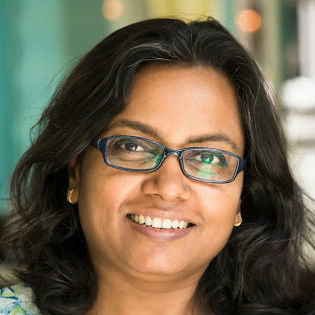 oh that skin, hair and physique is genetic material Aparna. I eat loads of salads and raw vegetables but can never get that skin of those pretty women :-) I am always tanned and freckled thanks to my frequent treks and hikes in the sun. Thank you and I am so glad you like my salads.